Are you the type of person who's planned their wedding since they were a little girl? Maybe, maybe not. Maybe you've been planning your bachelorette since you were little. Who are we to judge! There's just so much fun to be had out there. And now that you can call all your friends from throughout your life who might not live in your area anymore, you're going to make each and every event one to remember. Now, while we kind of wish we could party with you, we're happy to give you all the bridal accessories that'll make each and every photo a little bit more memorable. There's no need to have any element look like it belongs in your everyday wardrobe cause this is a special day and you're going to feel special, by golly! 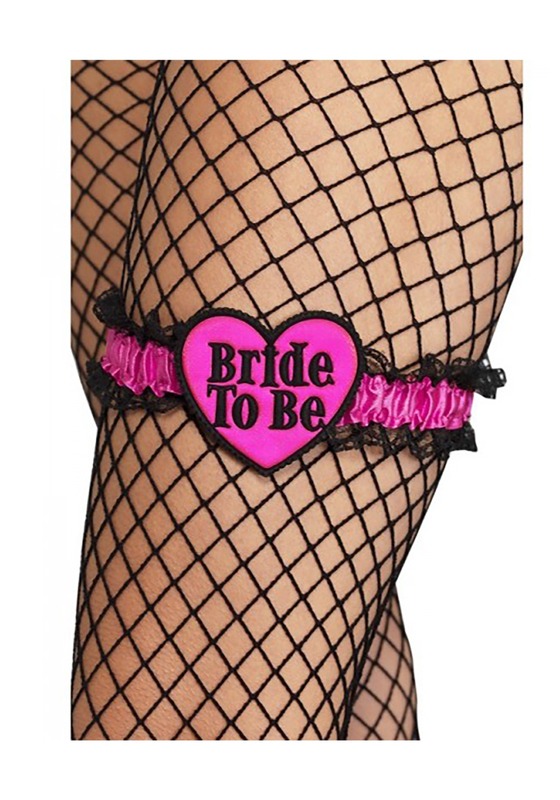 This garter is beautiful with shiny pink material that's plenty girly and a little bit slinky. It's trimmed with black lace and centered with a Bride-to-Be heart that'll stand out in real life as well as photos. Dressing up for a bachelorette party can go in plenty of directions. From throwing on a flapper wig and dress to ramping up your look with wild tights. We even have matching headbands that the bride, bridesmaids, and maid of honor can wear. It's your party, you can shine if you want to! Standard One Size 18" to 22" 18" to 22"